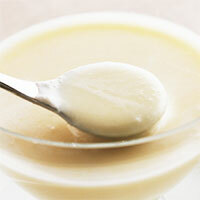 Vichyssoise is one of those amazing starters that have the most amazing aroma when served cold. However, for those who like their soup to make them feel warmer and comfortable, vichyssoise soup can also be eaten warm. The origin of vichyssoise is said to be France; nevertheless, there are some theories that claim that the origin of this soup is related to the USA. Vichyssoise soup is a thick white soup the main ingredient of which is puréed leek. Aside from leek, the preparation also involves onion, potato, chicken or vegetable stock, and cream. To make the flavor authentic, chive and parsley are usually added, along with white wine. With less than 100 calories per 100 grams, this starter dish is highly recommended for those who want to eat clean. The calories in Vichyssoise per 181.5g(1 cup) is 180 calories. Vichyssoise is calculated to be 99Cal per 100 grams making 80Cal equivalent to 80.81g with 15.3g of mostly carbohydrates、11.51g of fat、3.96g of protein in 181.5g while being rich in vitamins and minerals such as Sodium and Molybdenum.